Milton Moore is back, reviewing Musical Masterworks’ performances! We are delighted to share with you his review of Beethoven: The Complete Works for Cello and Piano, below. It’s always a major artistic event when a music presenter stages a complete cycle of works by a single composer, a marquee moment usually found only in big cities. This weekend’s pair of concerts presented by Musical Masterworks in Old Lyme surveying all of Beethoven’s works for cello and piano was not only a landmark achievement for the chamber music series, it had an extra celebratory buzz. The performers celebrated a deep connection not only to the series, but to each other. In his comments to the nearly full house at the Old Lyme Congregational Church, cellist Edward Arron referred repeatedly to pianist Jeewon Park as “my valentine,” and the husband-and-wife duo displayed a deep musical connection that seemed especially profound in their communication through the often mercurial transitions of Beethoven’s late sonatas. The very staging of this ambitious cycle by Arron and Park was also a celebration for the series itself, billed as a special event to help mark Masterworks’ 25th season. This was the first time that a Masterworks Sunday matinee did not repeat its Saturday night program, necessary to fit Beethoven’s five cello sonatas and three sets of variations into two days. 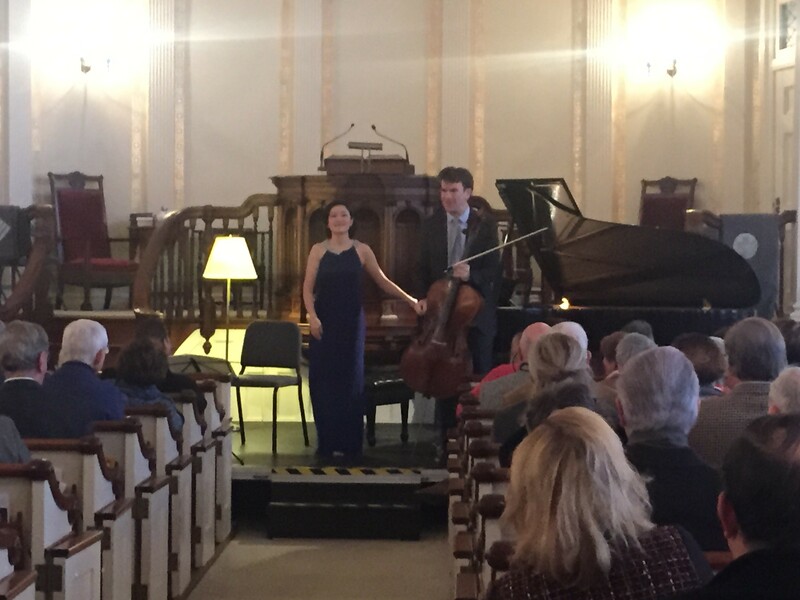 The stirring performances were an affirmation for these bedrock musicians for the series — for cellist Arron, who since becoming artistic director in 2009 has performed in virtually every concert since, and more importantly, for pianist Park, who made her strongest statement yet from the Old Lyme stage. When she first popped up on a program schedule after Arron’s arrival, you couldn’t help but think, “uh oh, the girlfriend.” But in her recurring appearances in recent seasons, and especially this weekend, Park has proved herself an exciting and thoughtful musician who is often the glue unifying whatever ensemble she joins, a talent who travels on her own passport of achievement. The pianist-composer Beethoven naturally grounded his scores at the keyboard, and to make this point, Arron walked to the Steinway to heft the printed scores before Park. “She has 200 pages, and I have 36,” he said. Whether generating playful excitement in the florid runs of scales in the early sonatas, rattling the roof with percussive two-handed staccatos, tantalizing with Beethoven’s notorious off-center accents or holding our collective breath as master of the portentous pauses in the late sonatas, Park grabbed the spotlight and held it over two days. As Arron explained in his Saturday introduction, there couldn’t be a better choice for a cycle than Beethoven’s work for cello and piano, a body of work that spans and illuminates the three oft-cited phases of his career. From his early period came two Classical-style romps. From the heart of his “heroic” middle period came one of his finest duo sonatas for any pairing. And from his late period, we have two otherworldly and often fleeting musical musings, like his other final works, unlike anything else. Saturday’s program touched all three eras with Sonata No. 1 in F Major, Opus 5, No. 1, Sonata No. 4 in C Major, Opus 102, No. 1, and Sonata No. 3 in A Major, Opus 69. The F Major was very much in the classical era mold of a piano sonata with cello accompaniment, and since Beethoven wrote the piano part to showcase the pianist he considered the world’s finest (himself), Park had some dazzling passagework to display, and she didn’t miss. In this sonata, as in some others, sonic balance was an issue, since Beethoven wrote this material for a much softer-voiced fortepiano, not a Steinway grand. The great A Major Opus 69 offered more equanimity, with Arron’s returns of the noble opening theme growing in impact and his muscular phrasing matching the sonic stun grenades erupting at the keyboard. In Sunday’s program, Arron also had his most transporting moments of lyricism, in several variations of the two sets of variations performed and in the sorrowful resignation of the opening adagio in Sonata No. 2 in G Minor, Opus 5. Before performing Beethoven’s final sonata, that utterance from his profound deafness, Sonata No. 5 in D Major, Opus 102, No. 2, Arron said the static slow movement has the ability to suspend time – and he made good on his claim. As the trancelike movement played out, Arron’s austere phrasing over Park’s funereal tread bent time hypnotically. And the final fugal movement spun out like convocation of all the musical forces that shaped Beethoven – and this audacious program. The packed houses, the audience enthusiasm and the winning performances proved that Masterworks’ gifted musicians and its devoted audience are ready for bigger challenges. Bring it on.